REDCap (Research, Electronic, Data Capture) is an NIH-funded, free, secure web application for building and managing online surveys and databases used by over 3,000 institutions and is cited in more than 6,000 journal articles. While REDCap can be used to collect virtually any type of data (including in 21 CFR Part 11, FISMA, and HIPAA-compliant environments), it is specifically geared to support online or offline data capture for research studies and operations. The REDCap Consortium, a vast support network of collaborators, is composed of thousands of active institutional partners in over one hundred countries who utilize and support REDCap in various ways. 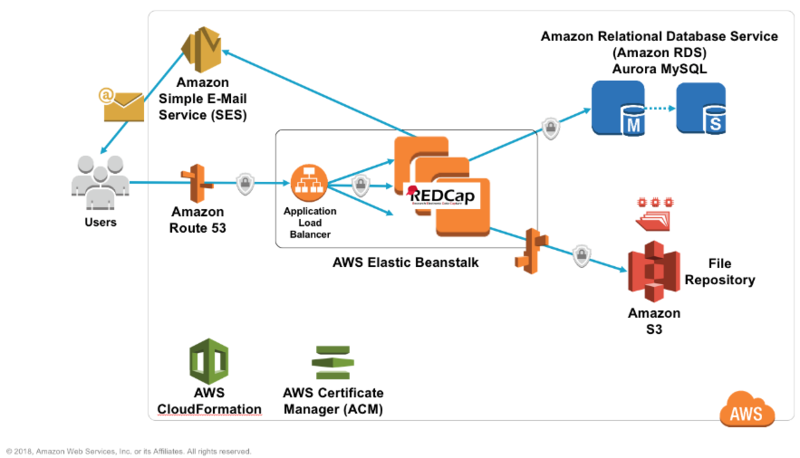 A high-level diagram showing how the different functions of REDCap map to AWS Services is shown below. “We think that organizations will be more likely to adopt REDCap because the AWS CloudFormation template makes hosting REDCap so easy and affordable,” said Rob. Visit the GitHub repository, which contains AWS CloudFormation templates to automatically deploy a REDCap environment that adheres to AWS architectural best practices. And learn more about AWS for research here.